If you're looking for the prettiest ski resorts in USA then you really need a list like this. Although USA has mostly purpose built ski resorts, they are thoughtfully styled and USA does not suffer from the 60's prefab carbuncles of some ski resorts this side of the pond - if you're looking for the traditional mountain architecture of a chocolate box ski resort, you can find it in pretty American ski resorts and, unlike the old moutain towns in europe, everything works too! This list of USA's most attractive ski resorts is your passport to ye olde alpine charm and traditional ski resort prettiness - think "Disney does Davos". 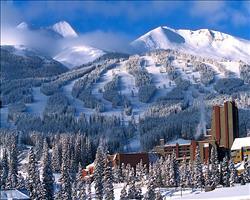 Here are the "must visit" 10 most attractive ski resorts in USA. “Prestige” is probably the word that best describes Aspen Snowmass. This is one of the most renowned resorts worldwide, with 4 ski areas, exclusive dining and après, high end shopping and the chance to rub shoulders with the A Listers. If you can afford Aspen Snowmass, there are few places to rival this exquisite destination. Encompassing an old cowboy town, mountain resort, 2,500 acres of inbound terrain and almost limitless backcountry, Jackson Hole should definitely be high up the bucket list for any passionate skier. It was voted “Best Overall Resort in North America” by SKI Magazine - if that’s not enough of a reason to visit, we don’t know what is. With its own mountain range and signature champagne powder, Steamboat resort is seriously world class (a record number of Olympians call it home). Ski Town USA - the legendary Cowboy town of Steamboat Springs - is a few miles down the mountain and we love its friendly locals, proper pubs and unpretentious vibe. You’ll be hard pushed to find someone who hasn’t heard of Vail. Rivalling Aspen as the resort of choice for the uber rich and super famous, it’s the 2nd largest ski area in the USA, has a vibrant cosmopolitan town and offers an outstanding visitor experience - one of the best in the world. Despite world class terrain, a reputation as a fantastic family destination, being super close to Denver and having the best 10 year snowfall in Colorado, Winter Park has managed to remain down to earth. Fending off the glitzy, commercial nature associated with other resorts in the area, it lets the quality of skiing and terrain do the talking. The clouds that descend on Park City after crossing the neighbouring desert drop some of the best snow on earth onto the varied 3,300 acres of terrain. Group this with a vibrant and exciting town and you have the makings of an outstanding ski holiday for every type of snow lover. Beaver Creek’s sense of sophistication is more subtle than its famously classy neighbour Vail, though many argue it’s of a higher calibre. Offering a quiet, convenient and refined skiing experience - a world away from home - this is a seriously good place to ski, with umpteen accolades to prove it. We love Breck - an outstanding, all-round resort with a friendly atmosphere, heaps to do and an infectiously bubbly après scene. It’s the birthplace of competitive freestyle, has some of the highest quality skiing and snowboarding in the States and is repeatedly rated as one of the best ski resorts in the world. When everyone thinks about the world’s biggest ski area, they immediately think of the Three Valleys, which works in Lake Tahoe’s favour as it keeps lift queues and piste density down. Add this to well over 20,000 acres of the most varied skiable terrain, Las Vegas style après, Californian sun and breath-taking views, and you have a truly epic ski area.